Shame on me. I drive the hour to Albuquerque in single file to hide my numbers. In truth, I’m so nervous that at one point I actually consider turning around. 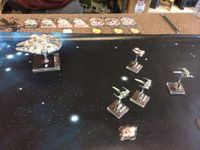 Jeff charges his ships straight across the table into the asteroid field, which I don’t expect. I’ve banked round enough to get shots, though. Han gets a crit on the Alpha but it’s Munitions Failure so that’s useless. He hides in the asteroids and then decloaks Echo. Despite having three of his decloaking positions blocked, Jeff performs a very sweet turn using his Advanced Sensors and a barrel roll and Han only takes a Shield from Echo. Echo returns fire with two hits. I had an evade and I 3PO guessed zero so I evade his two hits. “Gunner,” he says. Whoops. That was stupid. I should have taken a hit. He makes me pay by taking 3 shields and I learn the lesson very quickly. The next round Han gets a hit and a crit on Echo and, you guess it, it’s a Direct Hit. I feel slightly cheap. The next round I get a hit and a crit on the Alpha and it’s all over in 18 minutes. Later that evening, Jeff and I spend a while online talking about Echo builds, about Gunner vs Recon Specialist, Tactician, Rebel Captive or Mercenary Copilot. Jeff definitely has a talent for Echo and I look forward to playing him again. I turtle my B-Wing and have Han come around to flank his ships. On reflection, it was pretty obvious that I would do that. But I don’t fly Falcons and I don’t even have one in the US – I had to borrow one for the tournament... mine arrives in a couple of weeks. 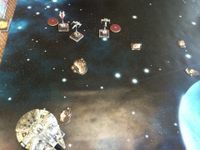 Han takes a shield from Biggs – I was hoping for more. Han loses a shield from Wes and then two more from Wedge. That’s annoying – Wedge shooting at me means that 3PO can’t trigger. My B’s HLC takes a shield and a hull from Biggs. The next round Han has a much better shot on Wes than on Biggs and doesn't have to shoot Biggs as the opposing Rebel formation breaks up. I only take 1 shield from Wes, though. Han loses 2 more shields and I realise I have to fly this Falcon better. But the HLC with Focus opens up on Biggs and with 4 modified hits and no greens Biggs is toast. Han turns nicely on Wedge and takes 3 hull and Wedge is down and then it’s clean-up. Shield Hull Hull on Wes who gets a Console Fire on Han. The next turn I take no Console Fire damage but nail Wes at range 1 and that’s the game in 25 minutes. 2-0. I'm glad I faced Jeff's squad when I did - the next round he adds Etan A'baht and that would have been a real problem for me. This is not the time to face a swarm. This can nail Han very quickly. I’m rather relieved when Shawn sets his ships up in two blocks and then charges them straight ahead because I’ve been able to set up to the side slightly so as we draw close his A-Wing and a couple of the Prototypes drop shots. X3 loses his shields to Han and Han loses one shield in reply. Using Swarm Tactics, X1 loses his shields and takes a Munitions Failure crit. Useless again! X1 is then destroyed and that’s a good start. Then he turns 5 guns onto my B-Wing, which is at range 2. 2 shields then 1 shield then 2 shields then one hull then a crit – Direct Hit! I can’t believe it. He’s lost a Rookie but I’ve lost an HLC Blue in the first round of firing. The next round X3 beaches and is destroyed by Han while one of his Bs loses a shield. Some of his guns turn to Wedge who loses 2 shields and one hull. This is not looking good. I’m not doing enough damage here and I’m having to spread fire sometimes. Now he has 5 shots to my 2. X2 loses his shields, a Bandit loses a Shield and then Wedge is nailed before Han loses 2 more shields. This is not looking good at all. His swarm has gone into the asteroids, though, so what saves me so far is that he has to drop shots to manoeuvre around them. X2 also loses 2 shields the next round and Shawn gets no shots at all. A Bandit loses a shield then Han loses one. Han still isn’t hitting hard enough and we’re starting to realise that Jacob is rolling like a god. Every time a ship with 2 attack dice fires, it rolls two hits or a hit and a crit. Someone watching also notices and tests his dice and they’re fine. X2 is destroyed and I’m back in the game. Han loses a Shield and then gets a Damaged Sensor crit. That’s serious trouble. I decide to flee and am able to clear the Damaged Sensor Array. I destroy B5 but take a hit and a crit and it’s Direct Hit. Now this is really close but I realise that I’m actually ahead on points with 16 minutes left. All I have to do is play for time and flee. But I’m in the top left corner facing left so my next move is obvious. Han loses another Hull but doesn’t cause any damage back. I feel like a fox being chased by hounds. I turn and he’s closing in quickly. It’s quickly the final turn and I have one hull left. I'm still ahead on points and I just have to stay alive. I realise that he’s expecting me to flee away from him so I decide to flee past him instead. But he’s read it perfectly – had I performed a hard one to the right he wouldn’t have had a shot but instead he has two. 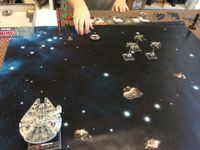 Han fires on the A-Wing that’s at range 1 and I get hit hit crit. He spends his focus token because he doesn’t want the crit to be Direct Hit (after the game we checked and it wasn’t!) but because he spends it I’m able to evade his shot. Finally his luck has started to wane. This is it. Last shot of the game. 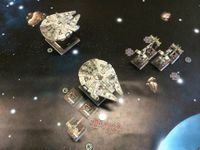 Bandit (with Damaged Cockpit crit that I had got in somewhere) rolls two dice at Han and rolls two hits. I’ve already spent 3PO. I have one hull left, I boosted so I have no focus. 2 green dice. Come on, green dice. I roll an eye and a blank. He’s killed me with the last shot of the game. It was a great game but I’m frustrated because I got so caught up in fleeing I didn’t think about fancy unexpected hard-1 turns. Shawn is now 3-0 and he’s about to add two more Prototypes to his squad. I realise I’ve just thrown the tournament with a bad choice of turn in the final round of that game. I’m really, really frustrated. At some point I remember kicking a bin. 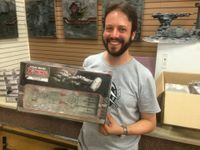 Possibly the X-Wing player with the coolest name ever in the world. Hunter has been playing X-Wing for three months and he lives near me so we’ve played a few games against each other. Let’s just say that he’s not happy that he’s drawn me but he’s doing well – he’s also 2-1. Then we realise that three of us are 2-1 – Hunter, Jacob and I. Jacob is playing Shawn. If Shawn wins, he wins the tournament outright 4-0. Jacob is just very slightly ahead of me on points (the TO announced before the tournament that if there were a tie it would be decided on points remaining in each round (I realise afterwards that this slightly favours large ship builds but I don’t complain!)). If Jacob wins and I win, I have to have 5 more points remaining on the table than he does in order to win. He’s got Etahn on the table but we’ve all been watching Shawn and his insane red dice rolling and it looks like it’s in the bag for Shawn. I have to concentrate on my game. Hunter wins initiative and chooses to give it to me. He sets up his ORS in the middle of the table and his small ship to the far right. 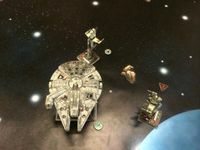 I set up with my small ships middle left and my Falcon far left. My small ships come out fairly quickly and my Falcon particularly so. It pulls Hunter’s ORS into attack position before his small ships can support and in the first turn he loses SSS, SH, HH, HH. He’s down to one hull and I evade his attack. Perfect start. I realise I have a problem. He knows his ORS is going to die but he has APLs and he has the drop on my Bs. When he does a hard 2 left turn, my Bs won’t be able to get past him unless they do a red 4 ahead straight into the path of his small ships and I have no intention of doing that. So my two Bs are going to crash into him. He does the hard 2 turn and I sigh. I pull out the 1 ruler and yelp in joy. I’m short by a millimetre. 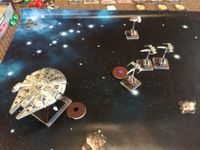 Han fires on Biggs and misses entirely but Wedge nukes the ORS instantly (because he had no evade dice against a range 1 shot!). 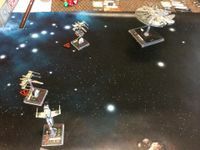 My PS9 HLC takes two shields from Biggs and then Hunter points all his guns at my Blue. With three target locks they take 2 shields, 2 more then 1 shield and 3 hull. Again, I’ve lost a Blue to sustained fire in one round of firing. My remaining Blue seizes the initiative advantage by running traffic but I get Wedge wrong and between us we create the most ridiculous mess I’ve ever seen on a table. 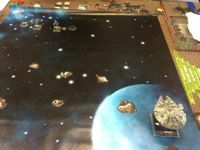 Han pounds on Biggs with two hits and a crit. Biggs is ... wait! Luke draws his fire and takes the crit. Smart. So I open up my B at range 1 on Biggs two hits two crits. Now Biggs is dead! Wedge hits Luke at range 1 and I roll 4 pure hits. That’s really nice. Luke loses a shield and 2 hull. Luke returns the compliment at range 1 and takes Wedge’s shield and gives him a Thrust Control Fire crit. His other B fires on Wedge at Range 1 and I’m riding my luck now – I get one crit and it’s Munitions Failure. That was sloppy flying and I was very lucky not to have paid the price for it. The next round the K-turning Bs are obvious, as is Luke’s green move to regain an R2 shield. What wasn’t obvious was Wedge crashing into one of the Bs. I don’t quite know how I did that. Then I realise that I’m actually actually a bit dizzy and must be dehydrated (imagine, a Tusken having to adapt to life in the desert... for shame!). I chug down some water. I become aware that in the Shawn / Jacob game, Shawn’s luck has completely evaporated and his swarm is being torn apart, particularly by Etahn but also partly because he split up his squad due to the fear of Assault Missiles that Jacob had brought. Shawn's getting frustrated because he knows he's dropping from first to third. I look quickly at their table and count up Jacob's points. I think I have to keep my B alive with Han in order to win this. Han hits the nearest B to him and takes 3 shields. Wedge shoots Luke from behind at Range 1 and gets a hit and a crit and it’s Direct Hit. No more enemy X-Wings. 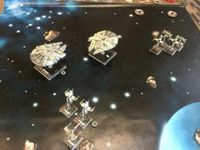 He fires at my B-Wing and takes 2 shields before the inevitable – Wedge is punished for his poor error and is destroyed at range 1. Now it’s Han and a Blue versus 2 Blues but Han is untouched. I’m feeling quietly confident. We move again. 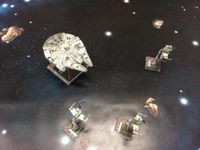 Han hits one of his Bs for 2 at range 3, causing another Direct Hit crit. He’s down to 1 hull. My HLC Blue takes 3 shields off the other B and in return fire loses 2 shields. This is mine now. Han fires Range 2 on his B-Wing and with three hits he’s gone. My Blue fires at his range 1 but unbelievably he evades it. I have to do this. Crucially, I'm becoming certain that I have to keep my B alive to have any chance of competing on points. 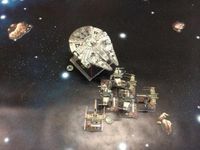 Han fires on Hunter’s B-Wing at range 1 with Focus. I take two shields and there are two crits. The first is Stunned Pilot, the second is Direct Hit! That’s the game. It’s taken 58 minutes and I’m now in second place. ... it looks like I’m going to have to learn how to play Epic! But that might be a bit silly. Great write-up !! Thanks for posting. Sounds like you had a great time. That millimeter still haunts me today. So close, yet so far . Still had a blast for my first tournament, can't wait for more!